A utility patent is protection granted by a government to an inventor for the way an article is used and the way it works. In jewelry, utility patents pertain to devices (also called findings), such as earring clips or brooch fasteners. All utility patents reproduced on this website were granted by the U.S. government and remained in effect for 17 years after issue. Only utility patents referenced in descriptions of pieces in the TruFaux Jewels collection appear below. Because findings were often produced by companies other than the manufacturer of the finished piece, the presence of a patent number may not offer much help in identifying the maker of an otherwise unmarked piece of jewelry. In addition, because utility patents remained in effect for so long, they are of limited use in precisely dating a piece other than indicating after what year it was produced. Utility patent numbers for the years covered in the TruFaux Jewels collection are seven digits long. 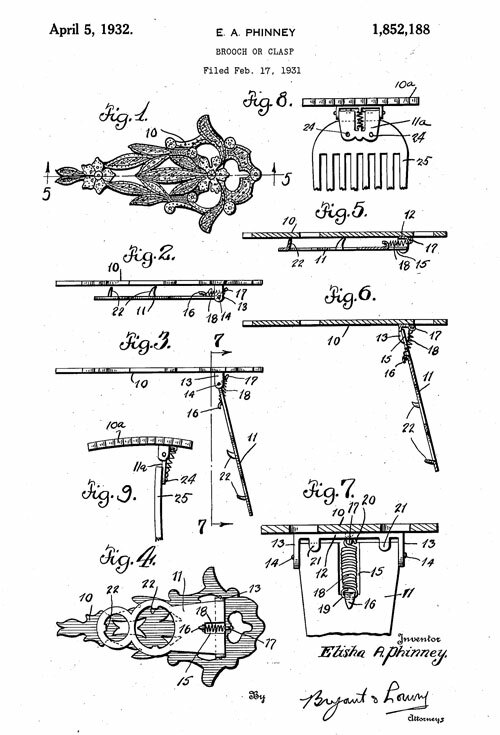 The first page of each patent contains technical drawings of the mechanism, with specific parts numbered. These numbers are referenced in the specification (the detailed description of the mechanism, and the manner and process of making and using it), which follows the technical drawings. The specification includes the name of the person(s) to whom the patent was granted, the assignee (if any), the date of the application, and the number of claims (the specific attributes of novelty of the item, which define the scope of the protection of the patent). 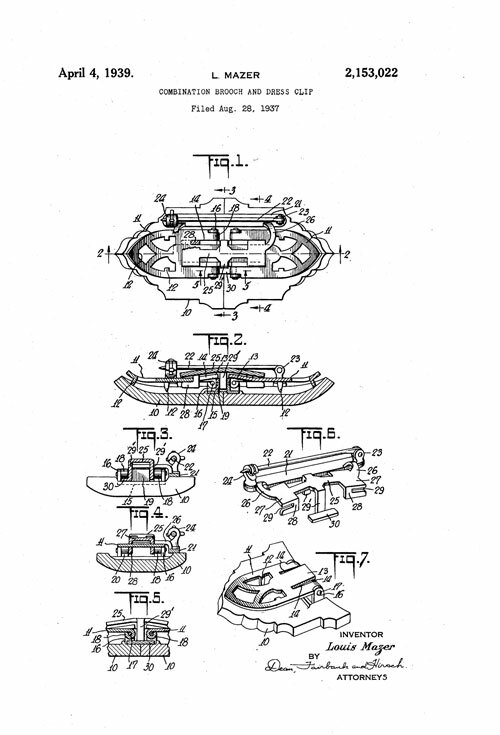 Only the first page of each patent (the technical drawings) is included here. 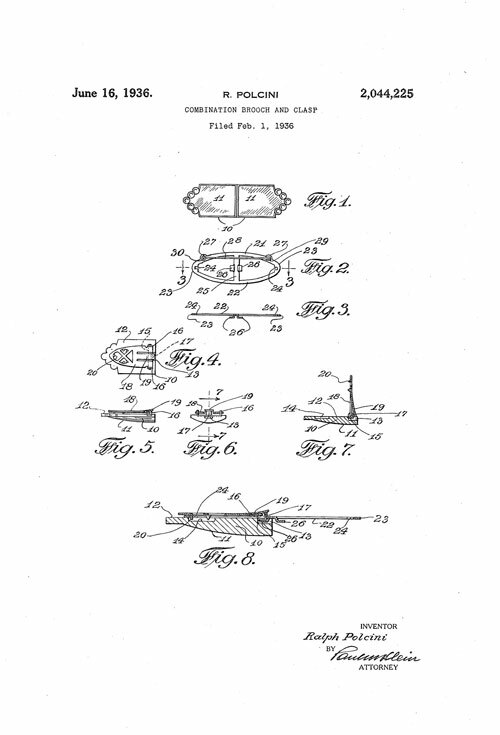 To obtain a complete copy of any of the patents shown below, go to the Google patents website and enter the seven-digit patent number in the search field. Line bracelets, which were narrow links with single rows of round or square-cut glass stones in one or more colors, were known as flexible bracelets in their day because of their full articulation. These patents are arranged chronologically. Wachenheimer Brothers, makers of one-, two- and three-row flexible bracelets with the Diamonbar trademark, based their construction on two patents. 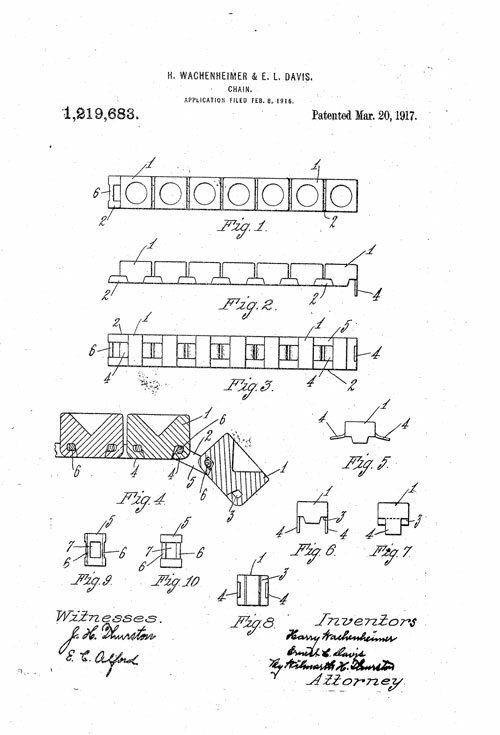 The first was issued to Harry Wachenheimer and Ernest L. Davis for a Chain on March 20, 1917, and assigned to Wachenheimer Bros. Bracelets made with this construction are marked with the date of patent issue (3 20 17) rather than the patent number. 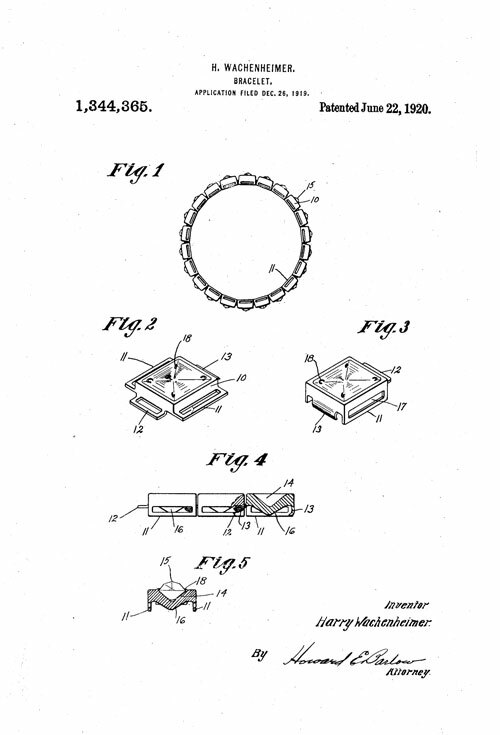 The second patent associated with Diamonbar bracelets was issued to Harry Wachenheimer for a Bracelet (which he described as an “improved flexible bracelet”) on June 20, 1922. The patent was assigned to Wachenheimer Bros. 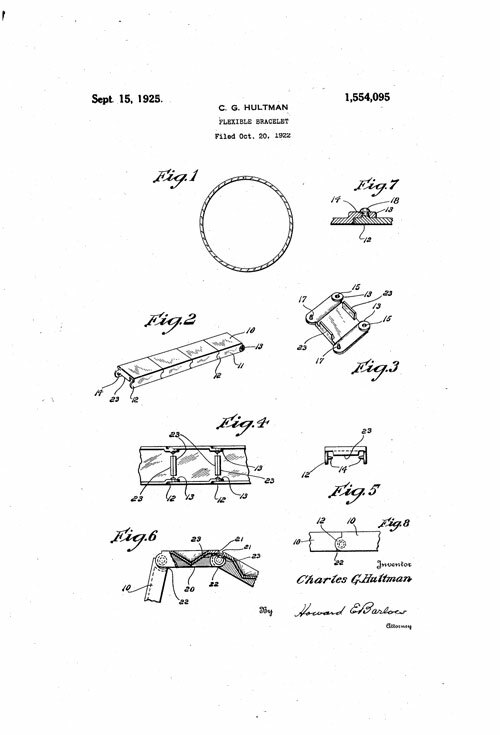 Although I can’t determine to which manufacturer Hultman (of Providence, Rhode Island) was connected, I do know that he was granted a patent for a Flexible Bracelet on September 15, 1925. These patents are arranged chronologically. 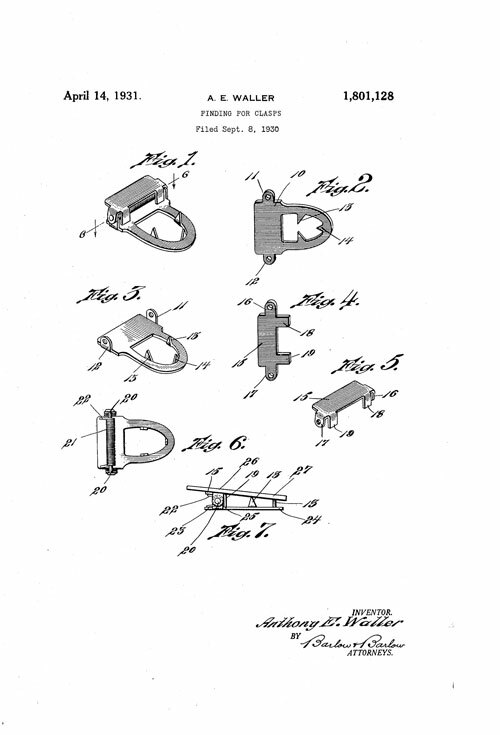 Anthony E. Waller, of Providence, Rhode Island, was granted a patent for a Finding for Clasps on April 14, 1931. 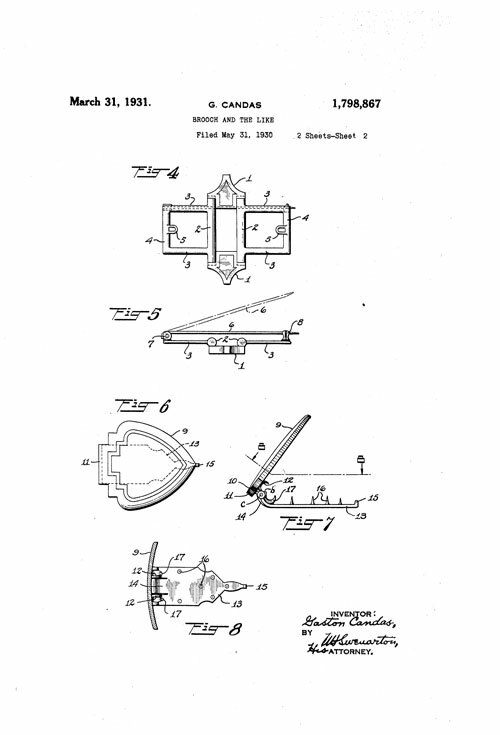 Elisha A. Phinney of South Attleboro, Massachusetts, received a patent for a Brooch or Clasp on April 5, 1932. He assigned the patent to the Geo. H. Fuller & Son Company, of Pawtucket, Rhode Island. 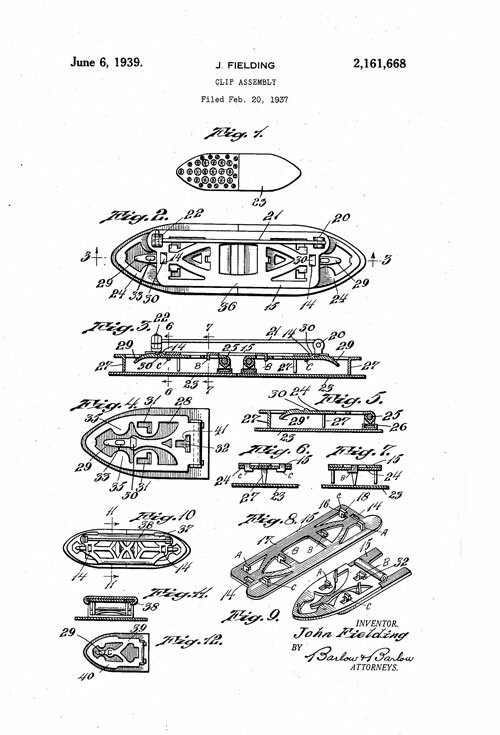 John Fielding of North Providence, Rhode Island, received a patent for an Ornament Retaining Device on January 30, 1934, which he assigned in-part to Joseph P. Whitaker of Apponaug, Rhode Island. The two men formed the Whitaker-Fielding Co., a findings manufacturer, in 1920 in Providence, Rhode Island. The mechanism that became Coro’s Duette was created by Gaston Candas of Paris, France, for fine jewelry. 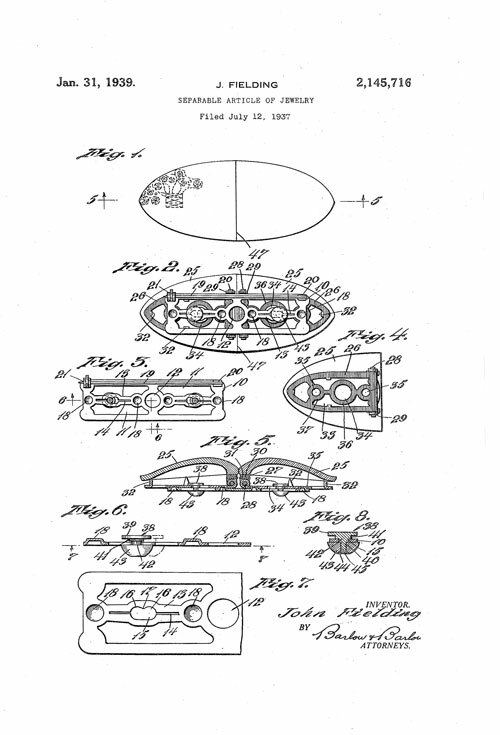 His U.S. patent for a Brooch and the Like was issued on March 31, 1931. Coro bought the patent in 1933 and launched their first Duettes in 1935. This product was so successful that other companies started inventing their own devices for mounting separate clips on a single frame that could be worn as a brooch. 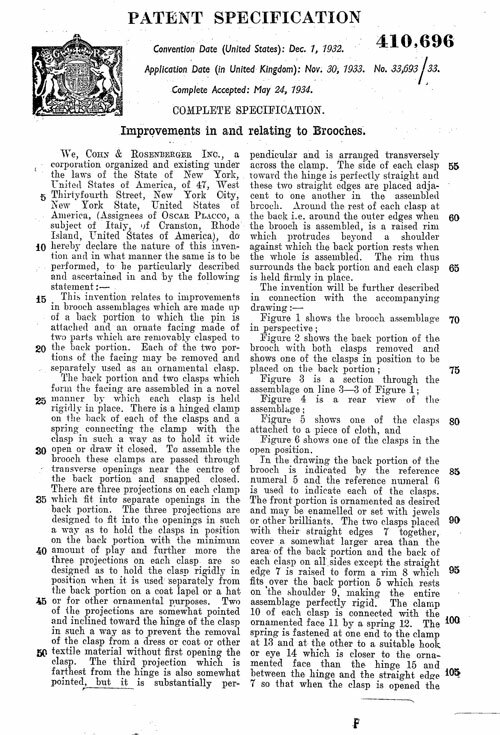 Oscar Placco, a subject of Italy, of Cranston, Rhode Island, was granted a British patent for Improvements in and relating to Brooches on May 24, 1934. 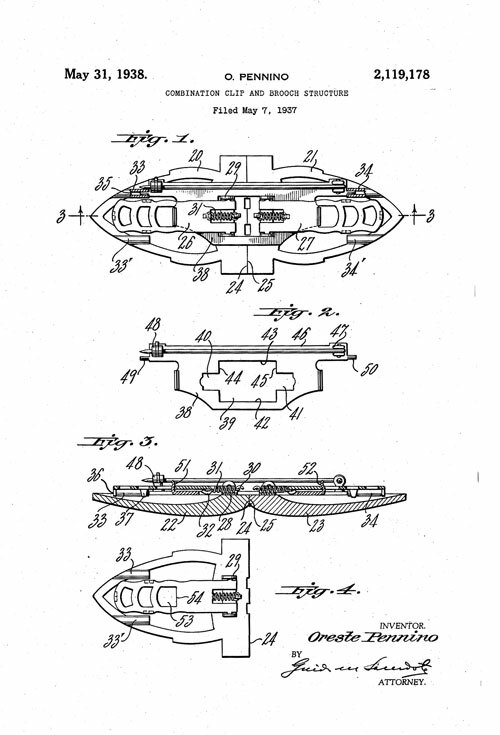 The patent for this mechanism for a double clip brooch was assigned to Cohn & Rosenberger (Coro). The founder of Leading Jewelry Company, Ralph Polcini of New York City patented a Combination Brooch and Clasp on June 16, 1936. In the same year, Wilhelm Goetz of Providence, Rhode Island, patented his Brooch and the Like on June 23, 1936, and assigned it to the C. & G. Manufacturing Company, Inc., also in Providence. Trifari’s answer to the Coro Duette was their Clip-Mates. This mechanism, called a Brooch and patented by Alfred Philippe on August 11, 1936, was actually the company’s second invention of this type. 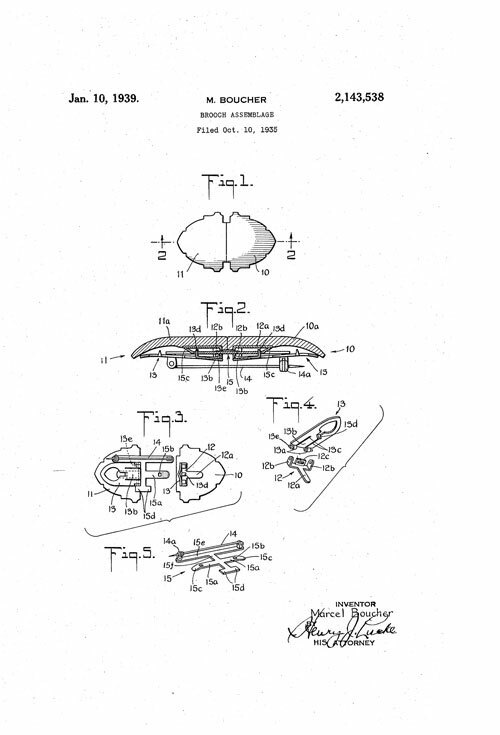 Gustavo Trifari was issued patent # 1,878,028 for a Clip Brooch on September 20, 1932 for Trifari, Krussman & Fishel, Inc. 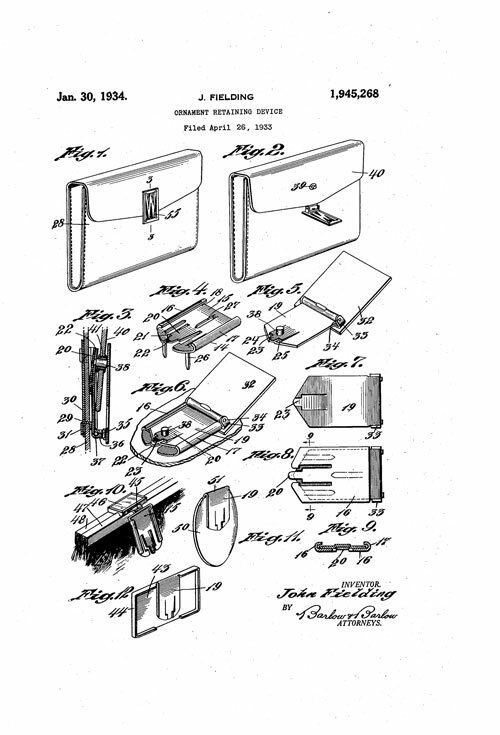 The only utility patent issued to Oreste Pennino, this Combination Clip and Brooch Structure was patented on May 31, 1938. 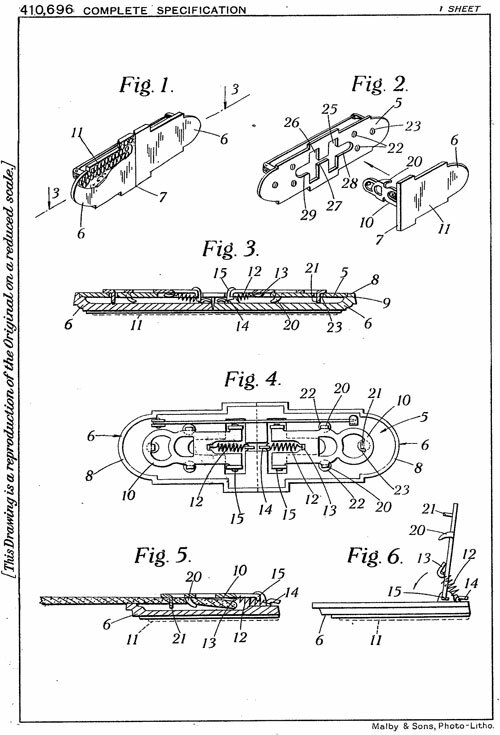 Another well-known maker who patented double clip brooch mechanisms was Marcel Boucher. Actually, he invented six: two while he was working for Mazer Brothers and four after he started his own firm. 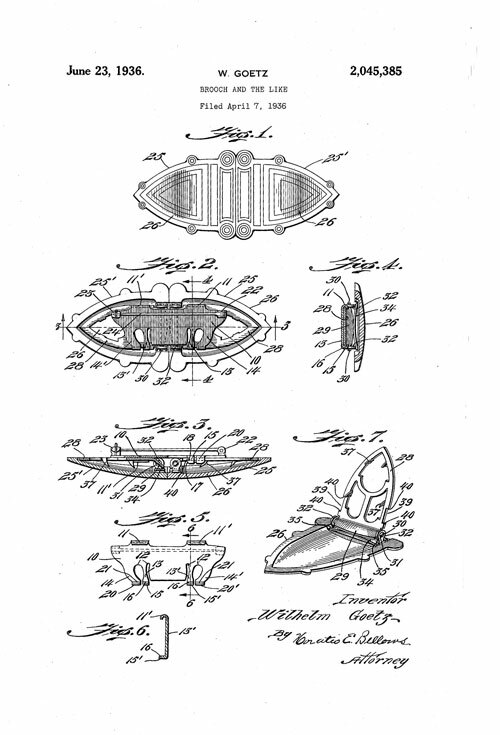 This patent, the last, was issued on January 10, 1939, for a Brooch Assemblage. Although Marcel Boucher invented two double clip brooches for Mazer Brothers, Louis Mazer patented his own design for a Combination Brooch and Dress Clip on April 4, 1939. The application was filed on August 28, 1937, after Boucher left the firm. This inventor of one style of dress clip (shown above) patented two double clip brooch mechanisms: the first, a Separable Article of Jewelry, on January 31, 1939; the second, a Clip Assembly, on June 6, 1939. In both cases, the patents were granted two years after their applications were filed and after Fielding`s death. 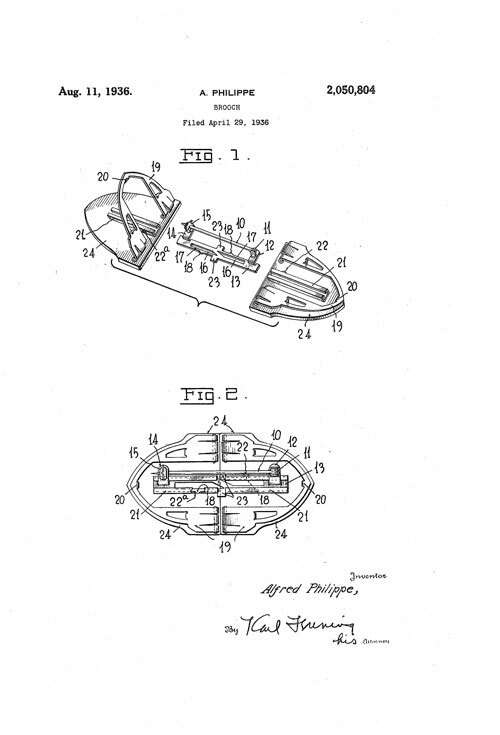 Both patents were assigned to Joseph P. Whitaker, the surviving partner of Whitaker-Fielding Co., a findings manufacturer. 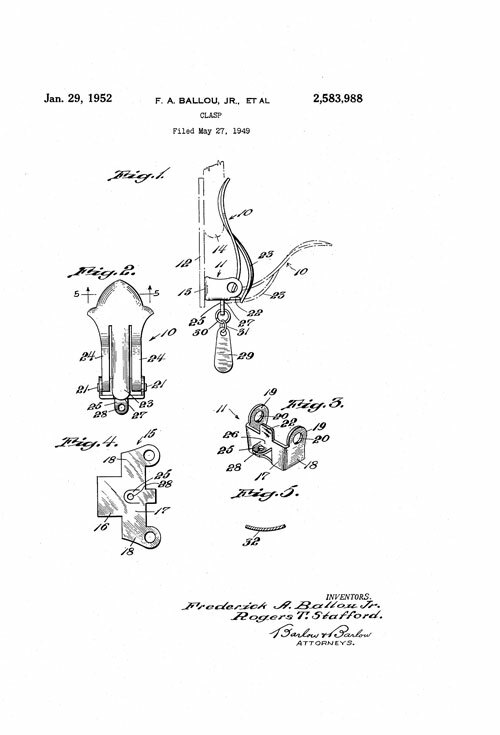 Jellinek’s patent for Clip Jewelry, issued on May 21, 1946, is most often associated with the earring clasps used by Miriam Haskell starting in 1960. This combination clip-back/screw-back mechanism allows the wearer to adjust the pressure of the lever. 1949: B.A. 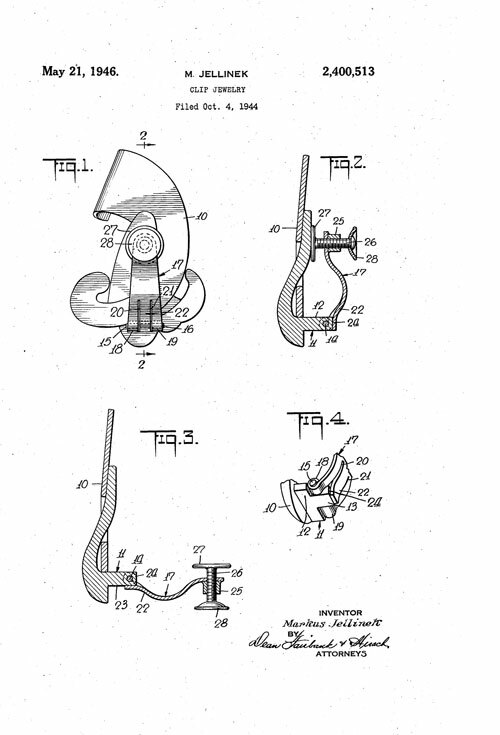 Ballou & Co.
Interestingly, Frederick W. Moulson (of Rehoboth, Massachusetts) was granted a design patent (rather than a utility patent) for an Ear Clip Finding on December 13, 1949, which he assigned to B.A. 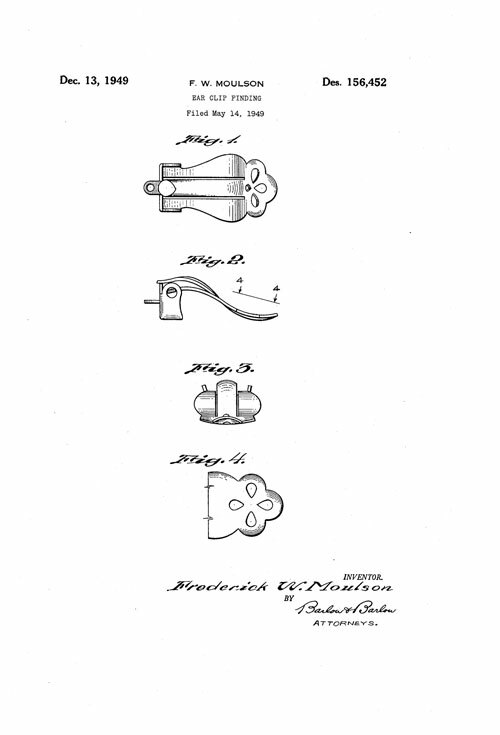 Ballou & Co. I`ve included this patent here because it pertains to an earring clip. This mechanism can be found on many of Elsa Schiaparelli`s earrings. 1952: B.A. Ballou & Co. The patent for a Clasp (a type of earring clip) was issued to Frederick A. Ballou and Rogers T. Stafford on January 29, 1952. It was assigned to B.A. Ballou & Co., Incorporated, a Rhode Island findings manufacturer that is still in business. Elsa Schiaparelli was one maker who used this particular earring clip-back mechanism.